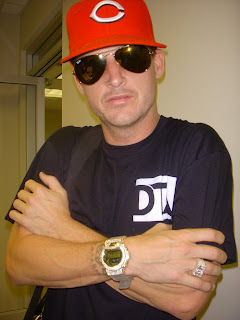 Rob Dyrdek is seen here cool and chillin while he is styling his custom made diamond G-Shock by ZShock. The watch is the rare 25 year Anniversary edition of the G-Shock 6900 series. We searched high and low for this watch to make it happen for him. Thanks to Rob for showing Love. Shouts to Talisha at the Factory as well. Wait until you see the next piece we got on deck for Rob! Another player in the game who keeps an icy G-Shock by ZShock in his collection of toys. Quincy Brown a.k.a. 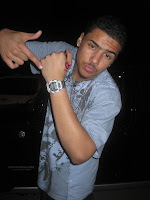 IQ shouts out ZShock for creating his custom Diamond G-Shock appropriately nicknamed the Q-Shock in honor of IQ. Quincy is well know as the son of Sean "Diddy" Combs and ZShock knows we are gonna see a lot of this talented young man in the near future. His musical talents are very evident. Q, ZShock appreciates the love! Another example of a baller that knows it's important to keep an icey G-Shock in the collection. Great new video of Big Sean and the Getcha Some joint, directed by none other that Hype William's (good call by the way). Watch for the G-Shocks and that awesome Jesus piece in this video. ZShock rolls with Big Sean and his music. This guy has a bright future and we urge you to follow his carreer.